Breakfast in the hotel. 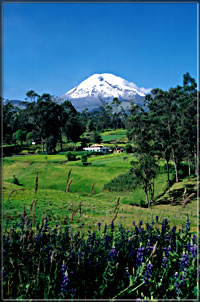 Depart from Quito through the Pan-American North Highway via Cayambe. Brief stop at Guachalá, (old equatorial monument). Passengers will have the opportunity to taste the delicious “Bizcochos de Cayambe”, a type of cracker or bread baked in a clay oven (greatly paired with local cheese or caramel sauce). Afterwards, we will make a brief stop at “Miralago”, to admire a wonderful view of Lago San Pablo, amazing views. The tour then continues to Otavalo where Otavaleños (natives) set up a market in which a bartering manner of shopping is taken place. The market hosts a variety of different handcrafted items. Passengers may choose between staying longer in Otavalo or go to visit to the leather shops at Cotacachi. Return to Quito picking up passengers in Otavalo (spot determined by your local guide ), via the Checa Quinche road. Next day, after breakfast, you could choose between the following 3 optional activities: rafting / canopy / riding bike-motorcycle-4 wheel-buggies or jeeps ( Not Included) . Free time to have lunch (exclusive benefits for specific restaurants applies with payment made directly by passengers). During the afternoon departure towards Riobamba for trip extensions to “the Avenue of the Volcanoes. Accommodation in a typical hacienda of the region, dinner. The next day breakfast will be served and departure to the train station located in Alausí. From here you will l enjoy a train ride towards the famous ¨Devil’s Nose¨ (a magnificent work incrusted in the Andes), return to Alausí (train ride takes approx. 2 hours), Box lunch is included. We come back to La Cienega spend the night. Overnight. Spend 8 days exploring the interior of Ecuador, the pearl of South America. Visit the famous Otavalo market and explore the colonial town of Cuenca. Soak in the natural hot springs at Baños and Papallacta and relax at a charming hacienda, where you can walk in the foothills of the Andes..